Optics explores how light moves, through air, off of mirrors, and in everything known to man. But before we start calculating those things, we need some basic rules. Our first step is to characterize the path that light takes from point A to point B. Our initial guess might be that it travels in a straight line, but that's not exactly true. If you look at light going into water, we notice that the light "bends," or refracts. So how do we characterize the path of light? This problem involves finding the fastest route from A to B. This looks easy, but there is a catch: the velocity above the horizontal line is different from the velocity below the horizontal line. So how do you solve this problem? Rather than record the velocity of light in every single substance-the numbers get very big-scientists decided to keep track of the velocity relative to the velocity of light in a vacuum. This new measure is known as the index of refraction and is represented by the letter n. More specifically, n=c/v for any substance, where c is the familiar speed of light in a vacuum constant and v is the speed of light in the substance. Note that n=1 for air. This is known as Snell's Law and provides the basic rule that allows us to get started in exploring light's movement! As we see here, light doesn't always refract, but can reflect when changing mediums. This can also be explained by Snell's Law. Notice that sin can only be between -1 and 1. Let's say that n1>n2 and that the angle is just right so that n2/n1*sin>1. By Snell's Law, n2/n1*sin=sin. It's clear that there is no angle to make that equation work, which means that the light reflects instead of refracting, which is known as total internal reflection. The smallest angle such that the light reflects is known as the critical angle. You can see Snell's Law in action in the Geometer's Sketchpad drawing below. The red line is the path of the light; you can adjust the initial conditions by moving around the point on the left side or the point on the leftmost edge. You can also play around with the triangle. 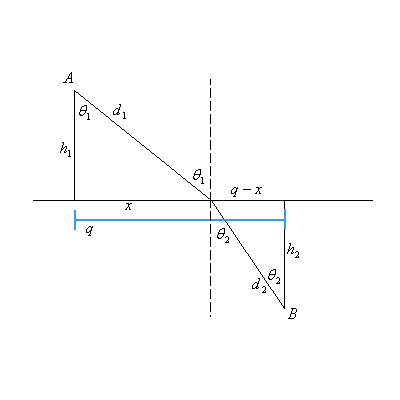 The sketch below has the outer index of refraction as 1 because the outside represents air, but you can adjust the index of refraction of the triangle by changing the length of the line below the label that says n2. Note that the simulation below only traces the path if it has up to 1 reflection; if the light reflects a second time, the simulation below will just have the light stop when it should reflect the second time. To ensure a correct trace, do not move any vertex beyond the opposite side-in other words, keep the order of the vertices the same. Also keep the source of the light to the left of the triangle.